Sorry, no knitting progress to show on my new shawl. I spent alot of time this week wrangling the charts into shape so if things run according to plan, it should be well on it's way by next week. However, I do have some spinning progress to show. I'd always struggled with the long draw on my Traveller but this week found much better success at it on the Saxony. 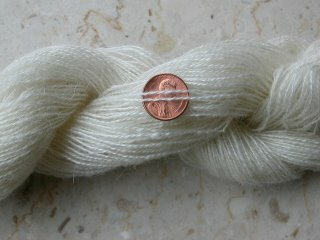 I had a bag of Pygora cloud I bought from Shady Creek Farm at the 2005 Michigan Fiber Fest. I'd planned to use it on the Russian spindle but figured it would be good long draw practice so I spun up this skein. It was so much fun to do! It still has some consistency problems, but overall I'm happy with it. I haven't washed it yet, so maybe things will even out when I do. Originally I planned on plying it with a silk thread and think if I had it would have reminded me alot of Kidsilk Haze (or one of it's cousins). It's very soft but still with that slight mohair-y feeling. It also has remarkable sheen without the addition of the silk. This skein came out to just over 200 yds and weighs a little more than an oz. Since I haven't spun anything on the Traveller since getting the Saxony, I figured it was about time I gave it a little attention. Wow, what a difference it was going back to the smaller wheel. I felt like I was treadling at double speed! But, it's so easy to adjust the tension on it and is like an old friend. This skein is from the big hunk of Blue Moon merino pictured in a post from a few weeks ago. We're having a very dark dreary day, so the colors are actually a bit brighter than the camera captured. 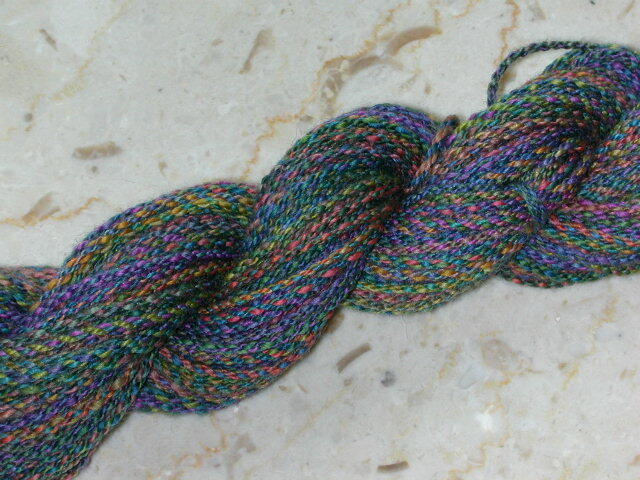 From a small amount I test-spindled, I could see that all the colors could get muddy if I just did a simple 2-ply yarn, so I decided to cable it. Cabled yarns are so much work (and talk about lots of treadling!) but I really like the results and think it will be effective when knit up with all those specks of color. Next week I plan to spin another skein from the same roving and Navajo ply it. As well as be well on my way on the new shawl. Stay tuned. The cable is gorgeous! The pygora is lovely too, nice job. Makes me want to get out my pygora, very inspiring. The pygora is gorgeous. Long draw? I am in awe. The cabled yarn is gorgeous. I've never thought of doing that with a multi - I will have to experiment at some point. The pygora skein is lovely. You do spin beautifully. I'm amazed at what cabling does with the colours. It's so pretty! Very pretty! That white pygora looks like a cloud. Your spinning is Beautiful! I love the cabled yarn. 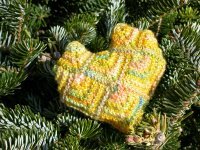 Thanks for sharing - I am inspired to try a cabled yarn myself seeing how pretty yours is.